When you need professional carpet cleaning, please refer to My Magic Cleaners. It's the only way to ensure that you get the best cleaning at affordable prices. Greasy spots, traces of mud or deep penetrated dirt don`t stand a chance when My Magic Cleaners deals with laundering of fitted carpets or rugs in your home. My Magic Cleaners is your first and last stop when you need a perfect carpet and upholstery cleaning at reasonable prices. We are confident in the success of any job that we take because we already have many satisfied customers throughout the city. Please contact us for the cleaning of every soft flooring. Carpet, rugs, upholstery or mattresses if it is in your home, we will clean it! · Then our carpet cleaners will determine the extent of contamination and stains. You can also ensure the cleanliness of your carpets for the years to come by purchasing the Scotch Guard - that’s innovative technology that prevents accidentally spilled liquids from absorbing deep into the fibers which respectively makes the cleaning process much easier and the excellent condition of your carpets maintained for longer. It is normal to ask yourself why and what eco home cleaning is preferably known and giving results methods offered by so many professional cleaning companies. Though it comes for the cleanliness of your home and the health of your family. The answer is easy. Eco cleaning is just as effective as other methods, but there is one main advantage - the lack of harmful chemicals. · Eco preparations are produced from biodegradable organic substances. · They can be used to flavor of the rooms in your home without the risk of it spreading of harmful, heavy aerosols. 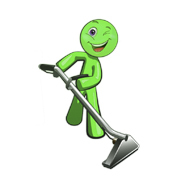 · Green cleaning supplies provide a quality cleaning without danger to you, your children and our planet. Eco home cleaning with steam is gaining popularity in recent years thanks to the advantages for the customer - from lower costs to the absence of any cleaning agents in the process. In this type of home cleaning using the power of water, heated to 160 °, which receives so-called "dry steam". It cleans and disinfects any surface with which they come in contact - carpets, sofas, rugs, mattresses, curtains.